João de MATTOS (my 3rd great-grandfather) was born 13 Mar 1833 in Ponta Garça, São Miguel, and was a shoemaker there. He anglicized his name to John after arriving in the Kingdom of Hawaii in 1883. He settled with his family on Main Road in Waipunale Homesteads near Hilo on the Big Island. He died 19 Mar 1917 in Waipunale and is buried in Papaaloa. Their son, Antone De MATTOS, (born 20 Feb 1868 in Ponta Garça), did not emigrate with his family, neither did the oldest daughter, Maria, or the oldest son, Manoel. Antone married Mary CABRAL and they had 13 children. His last employment was as a watchman for American Cannery Pineapple Company. He died 24 Feb 1947 in Honolulu and is buried at Diamond Head Memorial Park in Honolulu. Their daughter, Maria das Mercês de MATTOS (my 2nd great-grandmother), was born 01 Oct 1865 in Ponta Garça. She married João Germano CARVALHO (John Germaine) 10 Aug 1885 and had 12 children that reached adulthood. My great-grandmother, Maria Augusta CARVALHO, was the oldest. During his lifetime John was a stonecutter, a laborer on a sugar plantation, a dairy farmer, and a day laborer. John and Maria emigrated to the mainland arriving in San Francisco 03 October 1930 aboard the SS President Hayes. They settled in Campbell, Santa Clara County, CA, and remained there until their deaths; John in 1933 and Maria in 1948. They are both buried at Santa Clara Mission Cemetery. Their son, Manuel Sousa DeMATTOS, Sr., was born 18 Feb 1873 in Ponta Garça. He married Maria Trinidade VICTORINO in 1897. They had 6 children. Following the death of his first wife he married Maria De Gloria Do CANTO 11 May 1911 in Hilo. They had 8 children. He worked for the Kawiki Sugar Plantation near Ookala, Hawaii. He died 27 Mar 1942 in Keehia, Ookala, Hamakua, Hawaii and is buried at Papaaloa Catholic Cemetery, Hawaii. Daughter, Maria Stella DeMATTOS, was born 03 Feb 1875 in Ponte Garça. She married Antone Cabral CHAVES in Hilo and had 2 children. She died 02 Apr 1977 in Honoulu, Oahu, Hawaii and is buried at Diamond Head Memorial Park, Honolulu, Oahu, Hawaii. Daughter, Maria Rosa DeMATTOS, was born 05 Feb 1879 in Ponta Garça. She married Antone Frederick WALTJEN in Hilo and had 10 children. She died 20 Aug 1961 in Oakland, Alameda County, CA, and is buried at Holy Sepulchre Cemetery, Hayward, CA. Their youngest daughter, Mary DeMATTOS, was born in Waipunale on 09 Jun 1888. She married Joseph BAPTISTE 17 May 1903 at Honomu Catholic Church, Hawaii. They had 11 children. She died 01 Mar 1978 in Hilo and is buried at Alae Cemetery, Hilo. This fine steamer with her troop of Portuguese immigrants was reported off the coast soon after five o'clock on Wednesday afternoon. She arrived off the port about 7 p.m. the same evening and came to anchor near the bell buoy, and was shortly brought into port. She sailed from London on the 16th August, made a good passage to St. Michaels, arriving there on the 22d. After taking in their living freight she sailed again on the 30th August, at 4 p.m. with 1411 passengers, among whom where 530 children of twelve years of age or under. DOB: 19 Feb 1868 at 9:00 a.m.
***Special thanks to John Roias and Shirley Allegre for all of their assistance with my DeMattos family! I was idly browsing (as one does!) and came across your fascinating research. 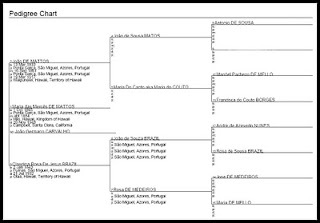 We have a reasonably well established family tree as far back as mid 18 hundreds when my great great great grand father came to England (early to mid 18 hundreds), but we haven't established anything linking back to Portugal. Would love to find out more - any tips? I was extremely fortunate to have two very experienced genealogists volunteer to help me with the Portuguese records. They came across the family tree online and offered to help. If I may suggest trying Family Search (https://www.familysearch.org/), as they have some records, although as I recall they did not have records pertaining specifically to the Azores. At the bottom of the entry are my sources, including the Family History Library microfilms for birth and marriage records. The FHL catalog has many microfilms, but, of course, translating the handwritten Portuguese documents requires patience and/or assistance. Well, it certainly did for me! :) I found some immigration records at http://www.lusaweb.com/ years ago, but that required a paid subscription. I wish you well in your endeavor!